The Arizona Coral snake (Micruroides euryxanthus), also called the Sonoran Coral snake, is one of three Coral snakes in the U.S. 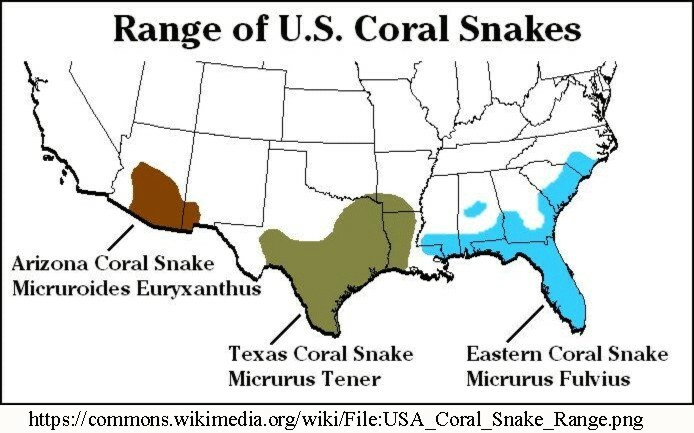 The others are the Texas Coral snake and the Eastern Coral snake (see range map below). The U.S. Coral snakes are small. Adults generally range from one to two feet long. Arizona Coral snakes occur in central and southeastern Arizona, southwestern New Mexico, and in Mexico as far south as Sinoloa. By the way, Coral snakes fart as a defensive behavior. The Arizona Coral snake is a tri-colored snake with bright red and black bands and a third band that may be yellow, cream-colored, or white. The bands go completely around the snake. The head is black above and below from the snout to just behind the eyes. The Texas Coral snake is very similar in appearance to the Arizona variety while the Eastern Coral snake is generally darker in all its colors. The Arizona Coral snake has neurotoxic venom like the cobra and mamba. Its appearance is similar to two harmless kingsnakes, the Milk snake and the Mountain kingsnake. How do you tell them apart? There is a saying which has several variations but goes something like this referring the arrangement of red, black and yellow/white bands: “Red touch yellow, kill a fellow (or red touch white, take flight); red touch black, OK Jack.” That is true for all Coral snakes in the U.S., but not for Coral snakes south of Mexico. 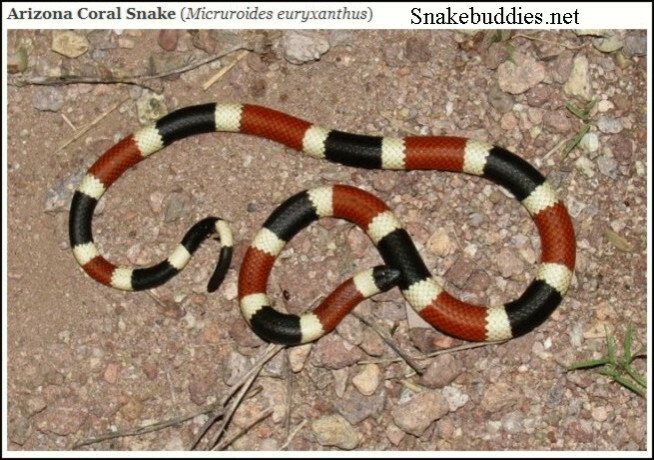 Also, there is one harmless “red touch yellow/white” snake in Arizona, the Sonoran shovel-nosed snake (it has a white snout). 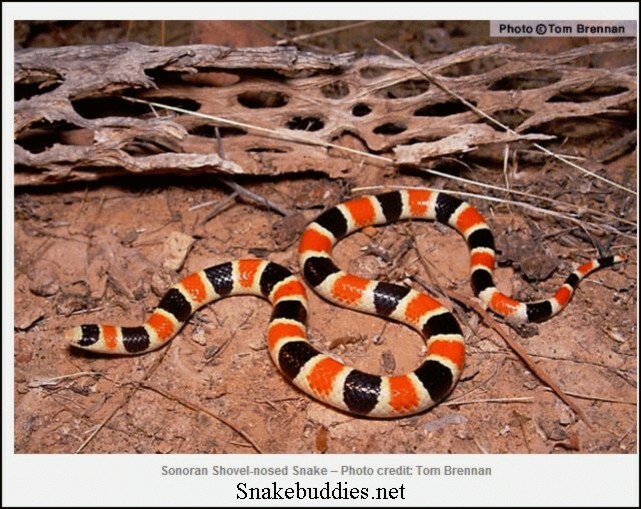 “Unfortunately, there are at least a couple of very common myths about Coral snake bites that we want to address. You may have heard that Coral snakes have very small mouths, and can only bite you on the webbing between your fingers. This is absolutely not true. If you pick up one of these snakes, it will potentially bite any part of your body within reach. Another common myth that needs to go away, is that Coral snakes are ‘rear-fanged’ with tiny teeth, requiring them to ‘chew’ on you to inject any venom. Not only are Coral snake fangs located in the front of their mouths, as is the case with all Elapids, but they do not have to chew on you to inject venom. Although their fangs are small, they are long enough to break the skin, which allows their venom to enter your blood stream.” Unlike rattlesnakes, Coral snakes cannot fold their fangs back into their mouth. A note on terminology: “Antivenom” versus “antivenin.” According to Wikipedia: “The name “antivenin” comes from the French word venin, meaning venom, which in turn was derived from Latin venenum, meaning poison. Historically, the term antivenin was predominant around the world; its first published use being in 1895. In 1981, the World Health Organization decided that the preferred terminology in the English language would be venom and antivenom…” The quotes above used both terms interchangeably. I changed them to antivenom for consistency. This articles was originally published in the Arizona Daily Independent. Posted in Natural History and tagged coral snake, kingsnake, shovel-nosed snake on November 3, 2015 by wryheat2.